Close to downtown without being in downtown Close to downtown Brisbane without being in the downtown area, free shuttle ferry service from here to cbd and Southbank which was great for the kids. The apartment had 2 spacious bedrooms and a decent living/kitchen. The washing facilities in the bathroom are a bonus for any long stays. Tired apartments, dated... None of balcony door would close let alone lock, very tired and run down blocks of apartments! Need a break from spreadsheets, KPIs and your overbearing boss? 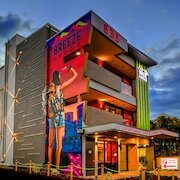 Situated 1 kilometre away from the heart of Brisbane, Kangaroo Point is an excellent place to base yourself while getting to know Queensland's impressive capital. Whether your trip is fast and furious or your pace is more chill, you'll find plenty to see and do. Check out some of Brisbane's most visited attractions, like Queen Street Mall, the Brisbane Convention and Exhibition Centre and Roma Street Parkland. 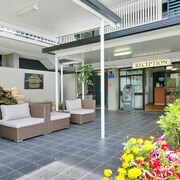 You can stay near Queen Street Mall at a number of hotels, like the Emporium Hotel, Spicers Balfour Hotel, Brisbane Marriott Hotel, Quest River Park Central and Hilton Brisbane. If you're after a different method of seeing the area, take a boat trip from Hawthorne Ferry Terminal. 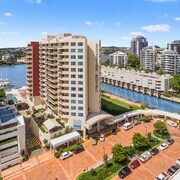 If you want to base yourself close by, two terrific options are the Brisbane Riverview Hotel and Domain Serviced Apartments. If you're after an alternative way of exploring the area, take a boat trip from Norman Park Ferry Terminal. Need somewhere to turn in around here? The Mantra On Mary and Mantra Midtown are favourites with many visitors. If you're going home and you're not a little bit scared to look at your bank balance, did you even go on holiday? 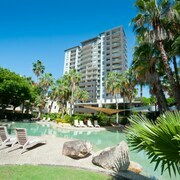 The Point Brisbane Hotel and Central Dockside Apartment Hotel are worth considering if you're into splashing a few more coins. 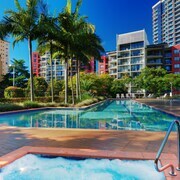 Why not think about reserving hotel room in Brisbane Central Business District or Brisbane when arranging your getaway? 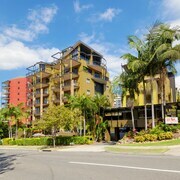 Brisbane Central Business District is only 1 kilometre from Kangaroo Point, and Brisbane is approximately 1 kilometre away. 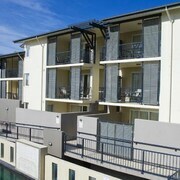 So, in a few clicks you can shut down the PC and begin packing your bag for an epic Kangaroo Point adventure. From hotels to flights, we're here to help every step of the way — just say the word!